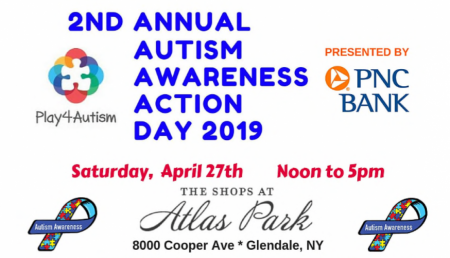 A day of music, games, food and much more will happen next month at the Shops at Atlas Park for the second annual Autism Awareness Action Day. The event, hosted by Play4Autism, a Glendale-based non-profit organization providing programs for kids on the spectrum, will take place on April 27, from 12 p.m. to 5 p.m. at the mall located at 8000 Cooper Avenue. Event-goers will be able to enjoy a wide range of fun and games, including face painters, vendor tables, a car show, raffles, food and drinks, and a live DJ. In addition to the string of activities, there will also be booths set up offering educational information about autism and special needs. Play4Autism hopes that the event will help increase the public’s acceptance of Autism by spreading awareness of the disorder. Proceeds from the event will go towards Play4Autsim’s “Kidz into Action” programs aimed at providing social opportunities for children with autism through sports. In addition to a bowling club, martial arts club, gymnastics club, track club, and many others, Play4Autism also hosts other awareness and fundraising events throughout the year, including a Halloween Fun Run. The organization is also raising money to open their own recreation center to run the programs out of. For more information, contact Play4Autism founder Greg Vasicek at 718-440-9863 and visit the Play4Autism website.